GH3 Benefits And Side Effects | Does GH3 Increase Brain Power? The main active ingredient in GH-3 is best-known as a local anesthetic; this ingredient is procaine hydrochloride, which is usually called by another name, Novocain. GH-3 is said to improve brain function and may even have anti-aging benefits. GH-3, or gerovital, was first introduced to the world stage by Dr. Ana Aslan. She said GH-3 would help those with arthritis, inflammation of the arteries, hardening of the brain arteries, ulcers due to improper nutrition, balding, high blood pressure and many other things that afflict the body, especially due to aging. GH-3 is also said to enhance the mental activity of the brain, giving a person an all around feeling of well-being. 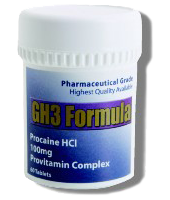 GH3 is a variation of the local anesthetic, procaine. It was developed for anti-aging purposes by the Romanian Professor Ana Aslan. GH-3 may also assist brain function by helping brain cells stay healthy; this improves memory, alertness, learning ability, and other brain functions, and may even provide the person taking GH-3 with a renewed outlook on life. It is also a nutrient, which functions in a similar manner as food does or other nutrients taken in by a person. When GH-3 is taken, the body absorbs it into its system, subsequently GH-3 boosts cellular growth throughout the body, including the brain. It enhances the various systems functioning in the body, making them more productive and healthier. GH-3 is said to give the mind, body and spirit a boost. Thanks to slick marketing strategies and "studies" that have been carried out in uncontrolled settings (often by those who stand to profit from the sale of Gerovital), misconceptions abound about GH-3's abilities. In fact, a landmark review from the National Institute of Aging stated that trials performed in a controlled, laboratory environment do not support claims that are made by Gerovital's manufacturers, and there were in fact major side effects that were resultant from GH-3 use, such as breathing difficulties, low blood pressure, and convulsions. How does GH-3 Help Brain Function? GH-3 helps brain function by working with brain cells and other systems in the body. It promotes learning ability, memory capacity, alertness, mental clarity and slows down the hardening of the brain arteries. GH-3 also improves a person's outlook on life, giving them a positive attitude, thus enriching their daily existence. The benefits on brain functioning usually vary from person to person, so it may take different periods of time for GH-3 to fully take effect. Do you want to know which supplement perform better than GH-3 as brain enhancers? Check out our brain supplement review chart.